The unending quest for easy Indian recipes just shows that the world is awakening to the goodness of Indian food. 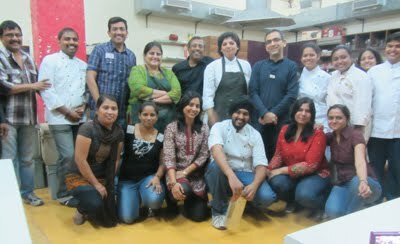 As this year of 2011 wraps up, we are more determined to work harder in promoting Indian recipes across the world. It would be appropriate if we sit back now and analyse as to where India stands today in terms of its cuisine. It may seem to be a distant dream in today’s context but soon a new year begins, and it may or can become a reality. India may not earn the slot at the Olympics but it sure has a cuisine that is rich in its true sense. We have offered to the world a cuisine that has in a short span of time, caught the fancy of quite a large number of people with a spicy palate. In last so many decades, the immigrants from India have successfully given a unique taste to the world—hot curries. Over a period of time this taste has been getting more and more popular worldwide. During this period the real and the actual taste of Hot Curry has gone through a metamorphosis. The tastes have been changed at times to suit the needs of the residents of those areas and on quite a few occasions because of lack of knowledge about the right taste. This ignorance on the part of the enterprising restaurateur has impeded the growth of Indian food to some extent as the consumer, i.e., the diner has at times been served with a taste that he or she is least expecting. Satisfaction has lots to do with expectation. Whenever we have served Indian food the way it is expected to be, we have succeeded. Now the time has come when we have to exceed expectations of the diners. On a global platform, we have to evolve ways and means of cooking Indian food to the expectations of a wide variety and range of people. It has been well established that most people eat food that they can relate to or at least the tastes they are familiar with. By no means are we insinuating that we cook food or change food to suit the taste buds of people. With the given diversity of our land, we have been blessed with unique and totally different tastes and flavours. From Meerut to Madras, from Ahmedabad to Agartala we have an array of dishes that probably would send even the most discerning of palate on a journey that can be termed as nothing but delicious. People eat food that they can relate to; for fast growth of Indian food it is imperative that we first find out the needs of the people of each International food zone and export tastes similar to what they have grown with. This way we would not only encourage regional Indian cuisine but also at the same time find right pegs for right holes. 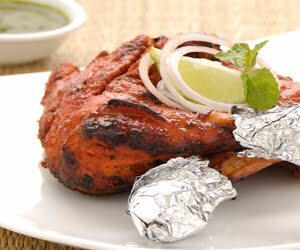 Gone are the days when one could impress everyone with Butter chicken or Vindaloo, now International diner expects in his home territory, a kind of taste that is completely Indian and suits his taste buds also. We are not using words as Authentic Indian Food because have yet to come across a large group of people or professionals agreeing to a common taste platform. Some traditional recipes for New Years Eve….Kesari Bhaat, Kachori Chaat, Tandoori Chicken. Easy Indian recipes are best followed from well written books. Indian cooking is wonderful and versatile and adapts fast to present day tastes. It can be kababs like Shikampuri Kabab, or something as flavourful as Narangi Pulav or a dessert like Gulab- e-Gulkand. These are made in a traditional manner but still live up to the standards of the modern palate that is looking for easy Indian recipes. Time for a new year, so time for a change. Best would be to start cooking more at home. This is especially becoming important for the upwardly mobile crowd who prefers eating out. They eat out for various reasons like celebrating an occasion, or as a change for the housewife from her daily routine etc. They order dishes that are exotic not just in taste but also well presented. But then they also would like to replicate these at home some time or the other. This is where good cookery books will come in handy. Looking at one book, Simply Indian, it caters to the health fads too. There are a number of recipes that can completely satisfy those who count their calories. Like for example Palak Shorba, Lemon and Coriander Soup, Gajar aur Kishmish ka Salad, Palak Chole, Missi Roti would rate high on the nutritional front. But ultimately while creating recipes the fundamental is ‘Taste is Paramount’. This book benefits anybody and everybody who loves food and love to entertain! You will find that the recipes in this book are such that would do your dinner table proud even in formal parties. Yet they are simple to make. These recipes can also be incorporated into daily menus thereby solving the housewife’s problem of “what to make for the next meal”. They are such that would satisfy the most fastidious of eaters. It is well said that while cooking anything, along with the rest of the ingredients, a generous dollop of love is absolutely necessary. For that matter anything presented with love is not only enjoyed and appreciated but also reciprocated in equal measure. I also believe that all food is healthy…that is why the Almighty has created them for us. Everything is moderation is good and everything in excess can be unhealthy, this holds true even for easy Indian food. Spent the weekend with family out of Mumbai to attend the 25th wedding anniversary of my cousin. The whole family gathered for the occasion and it was great fun to be with all of them together. It is good to take a small break from work like this! 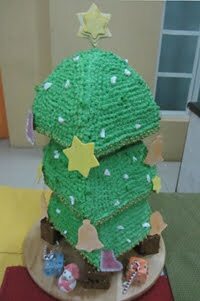 Friday saw the Christmas Cake competition in the office. The teams put up two great presentations and we had my good friend and talented chef, Anil Rohira, Corporate Pastry Chef Felchlin, as judge. After giving his valuable tips to the team, he declared a tie! Giving you the pictures here. Mumbai had the first of its kind ‘Maha Feast’ at the Gateway of India this weekend. A very good beginning, I do hope it becomes an annual event and Mumbai will have a show case of food to demonstrate to rest of India and the world. I would like to see more of street food and live cooking next year round though. 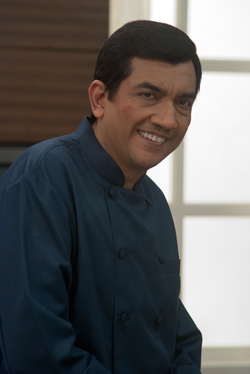 The telecast of my recipe on Master Chef India 2 on Saturday has brought in lots of enquiries for the recipe! Well, they are on http://www.sanjeevkapoor.com on display for you to make and enjoy! 2011 has seen the launch of FOODFOOD, my much awaited food channel. This year now enters Week 52, and it is time to send off my greetings to all my associates and friends. This year we have researched the ancient dietitics and come up with some nice food sayings in Sanskrit. This is a fulfilling experience as something beautiful, something traditional reaches out to others and also indicates to us that we are moving ahead in the right direction in exploring avenues of food and in teaching all aspects of food. Travel plans for January 2012. Around second week, planning to go to Bahrain for the launch of The Yellow Chilli. At present, the soft launch of The Yellow Chilli in Kathmandu has been done and what a response! There was a huge crowd willing to enter the place and the formal launch is yet to happen! As the party mood to usher in the New Year will be setting in, I will share some easy foods that can be made for your family and friends. This is in continuation of what you can find as breads when you are looking for Indian vegetarian recipes. A popular Punjabi deep-fried bread which is inseparable from chick peas especially in the combination of ‘chholay bhatura’. It would be more appropriate to call bhatura semi leavened as the fermentation is done with yogurt and baking powder. The downside of this bread is that is quite oily but once placed on a kitchen paper, some of the oil is absorbed. Oddly enough the name is derived from the Hindi word puri which means complete. Be it any major occasion like a party or marriage, puris will inevitably be gracing the tables. 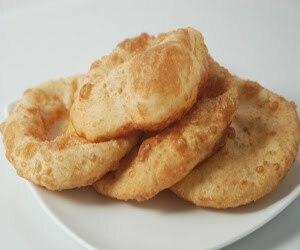 Called the queen of all breads, many puris can be fried at one time and when there is mass preparation this is the ultimate choice. Though the puffiness settles as the puris cool down, the fact remains that the bread is soft enough to wipe off many a gravy from a dish. Now this one is an artistic presentation! The origin lies in the Mughal days. It gets its name from its texture and size, though not its shape- for it is circular and not rectangular (handkerchiefs are!). The dough is made using plain white and whole-wheat flour and kneaded well. After being put to rest for 45-60 minutes the dough is ready for further treatment. It is rolled slightly and then flicked up with the tips of the fingers so that the stretching action increases the circumference of the roti. The griddle (tawa) is to be kept inverted, convex side up, on the heat. Once the roti is placed the cooking takes seconds to complete because the roti is very thin. Roomali roti is served folded in half and then quarter. Though best had hot, in case it is to be served later the rotis should be steamed or the container placed in an oven on medium heat for 5-10 minutes. It is important to serve this bread moist otherwise it tends to become papery and of course, rather unpalatable. Now that an extended and deep introduction has been made with Indian vegetarian recipes, let’s try out our hand at making a few more breads at home. Moong dal puri, Peshwari naan, Paneer kulcha. Many Indian vegetarian dishes as well as non vegetarian curries call for accompaniments like breads and these come in a large variety! Curry dishes are best enjoyed with Indian breads that come in various shapes, textures and taste. The best way to research is to order a breadbasket in an Indian restaurant. The variety served is an eye opener and then once you have sampled everything, reorder one that is your favourite of the evening. A quick run of Indian vegetarian recipes that make an ideal breadbasket follows…. Phulka: puffed whole wheat bread. The commonest and is eaten daily with meat and vegetable curries and dals. Called the chapatti sometimes but in actual terms a chapatti is generally flat and not puffed, it comes from the Hindi word ‘chapat’ which means flat. Phulka means one that is puffed as it is derived from the Hindi word ‘phulna’. One familiar but confusing usage of the term roti baffles a few. Roti is any unleavened bread like phulka, chapatti or roomali roti. ‘Parat’ means layer, and therefore parantha is a layered fried bread the layering of which is done by folding the dough while rolling it out. Depending upon the stuffing for the filling inside, many kinds of parathans are possible. 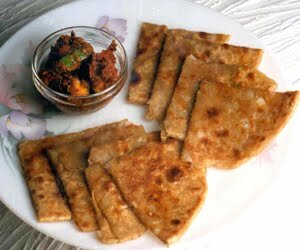 Plain paranthas are usually enjoyed with various curries. The same dough as that used for the phulka may be used to prepare paranthas. 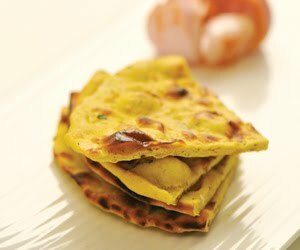 To make stuffed paranthas, the stuffing is added before folding and layering the flour. The stuffing used may be boiled peas, potatoes, cauliflower, onion or radish. For non-vegetarians, a popular stuffing use is minced meat. A bread which is seen more often than rotis in many Indian restaurants. Though of Persian and Afghan origins, naan is an incomparable combination of European bread and the Indian chapatti! One might think then that the recipe will be painstaking but that is not the case. In fact, the recipe works in favour of its universal appeal. White flour mixed with yeast and other ingredients gives dough that can be rolled out and put to cook in a tandoor. The final flourish is the sprinkling of nigella seeds! One test for a good cook is that if the dough for the naan is right, they should puff up. Back from cold and foggy Delhi after a successful launch of Sura vie. Not to mention the expected delay in flights!Anyway, a hectic few days ahead with the shoot for Sanjeev Kapoor’s Khazana from today. Will attend a Press Conference tomorrow morning regarding the Masterchef India show. I have a cook off with the contestants for the Press. Simultaneously, Chef Harpal is making more episodes for Turban Tadka in our office studios and to add to the activity the interior decoration of the new office spaces is going ahead at full speed. I can finally see the end of the renovation plans! More buzz as my team of chefs will be competing in the Christmas Cake Competition… look out for this space for their exciting presentations! For you some special baked goodies…. Indian vegetarian recipes are incomplete without talk of the staple food: the bread. Indian breads are the most nutritious around the world. Unleavened wheat dough, rolled out into thin diskettes, cooked on a flat cast iron griddle called tava and puffed to perfection form the ever popular phulka – that is the “puffed” one. Also called chapatiand roti in certain regions of the country, this bread is used not only as an accompaniment but also as a utensil. Imagine a typical Indian meal without roti? Or its other versions: paranthas or puris? Northern regions of the country boast of abundant harvests of golden wheat as also wonderful variations of wheat dough and refined flour. In fact now that the world is awakening to the nutritious and fibre rich ‘brown’ bread we can proudly say that Indians have the best ‘brown’ bread that is the roti! The first leavened bread was made in ancient Egypt, where the basic loaf was made of wheat or barley flour with the additions of mashed dates or honey for the wealthier. As India has been under the influence of many rulers it were the Persians that left behind the legacy of leavened bread. One of the few traditional leavened breads you will find in India is naan, which is also eaten in Pakistan, Bangladesh and Afghanistan. There are many different versions of naan: some contain yeast, some baking powder, some bicarbonate of soda and others a mixture. Some contain eggs and some milk. The contemporary variations use stuffing of keema which takes it out of the category ofIndian vegetarian recipes! Naan is found only in the north of India where it is baked in the dome shaped clay tandoors which too have been left behind by the Muslims rulers. Later, the Europeans (British, Dutch, Portuguese and French) introduced their own yeast breads. The Indians called them dubble roti, which means double bread and served them with spiced dishes that had rich sauces in need of mopping up. Chapati is the first Indian bread to be made popular in the west by Indian restaurants. As we continue the journey of the Indian bread basket being a major component ofIndian veg recipe collection let us try out some different breads this weekend. Bajre ke roti with raw banana stuffing, Bayee missi roti, Khasta roti.